Music has probably been an escape for all of us at some point in our lives unless someone comes from a crazy Footloose town. Alexandro Querevalú is a brilliant performer. He expresses a versatility in his musical interpretations, which are felt deep within the soul. Querevalú was born in Lima, Peru, to a humble, hard·working family. Being the oldest son in his family, he wanted to help his family financially. With that in mind, he emigrated to Poland when he was 18. The performer plays a wide variety of wind instruments, like the Quena, Quenacho, Antara, Basto Zampona and Malta Zampona. He has a large repertoire, such as The Last of the Mohicans, El Condor Pasa, and several other favorites. His live performances dressed in various Native American costumes are genuinely stunning. 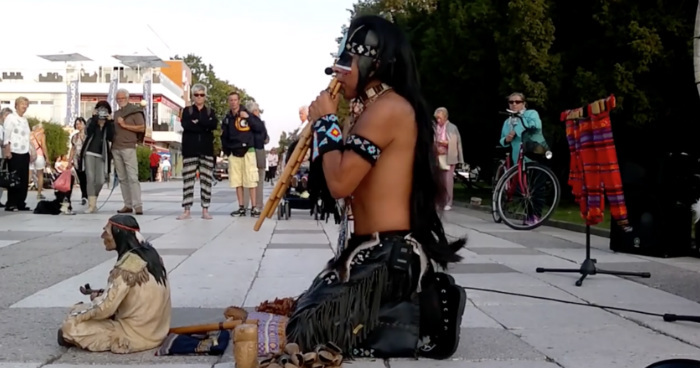 Alexandro still lives in Poland and gives live performances often on the promenade in Swinoujscie. Additionally, he was a contestant on a Polish talent show. Querevalú's artistic resume is wide, beginning from 1982 until today.